Hello crafty friends and welcome to Technique Tuesday’s WCMD Blog Hop! I am so very excited and honored to be a part of this amazing Blog Hop! If you are hoping with us today you should have arrived from Kymona Tracey’s blog! If this is your first stop please start at Technique Tuesday’s blog and hop along! So many amazingly talented ladies are participating in this hop and you don’t want to miss their beautiful creations! Comments will be taken through the end of Monday, Oct. 8th and the winner will be announced on Technique Tuesday blog on Wednesday, October 10th. Let’s get on to the card I have created for this hop! Today’s card was created using the brand new You’re Owlsome stamp set. 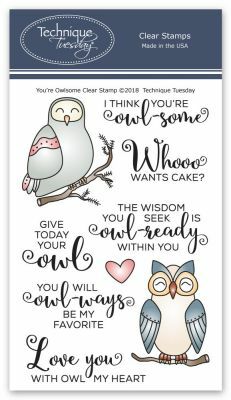 This wonderful set includes two beautiful owl images, a heart image and lots of amazing sentiments! To create the background I used three colors of Distress Inks and a homemade stencil (for the rays) then added some shiny splatter using Perfect Pearls mixed with water. Once the background was dry I white heat embossed the sentiment. To create my snowy owl I stamped the image with light gray ink and colored it with colored pencils. I then re-stamped the image with VersaMark ink and white heat embossed it. I used a coordinating die to cut the owl image and added foam tape of the back for added dimension then adhered it to the center of the panel. The finished background panel was adhered to the A2 size white card base with foam tape. I used white gel pen to add a few stars and that completed my card! Teri Anderson < ———— NEXT STOP! Pingback: World Card Making Day Blog Hop w/ Technique Tuesday | A bit of this. A bit of that. Love this card, Ana! It’s so pretty! What a great card! I really like how you colored the owl and the background is incredible. Your background is amazing! I love that you created the stencil yourself! I also love the subtle color on your owl! OooooAhhhh, what an exceptional card! I like the snowy owl presentation and your background is beyond amazing! Love the rays coming from behind the owl. Purple is my favorite color, and this card is amazing . Great background for this beautiful snowy owl. Happy WCMD! Such a beautiful card! thank you for the inspiration! Love that you used my favorite color for the background, and the rays are subtle but inspiring, letting the owl shine. Adorable snowy white owl card! I really love this technique… I’d like to try this. Thank you for sharing. WOW, I have to say you hit it out of the park with this card. I LOVE the way you created your background. (would actually like to know more about how you did create that background). The Snowy Owl concept just made the card over the top. Thank you for a wonderful card and great inspiration. Wow! Your card is awesome. The snowy owl is perfectly done. The background is gorgeous!! Great job!! What a stunner! Beautiful background and WOW – your coloring of the snowy owl is amazing. Awww!!! It’s so lovely!!! Your background is really stunning!!! What a beautiful card! Your snowy owl is absolutely gorgeous! Pretty background also! What a stunning snowy owl this is amazing! I love how you coloured it and created the background too. Thank you so much for your kind words Mary-Anne! Such a stunningly bold card…just love the stark white on that colorful background! This is an awesome card, I absolutely love that background! WOW what an amazing and unique and very beautiful card that you have created! The background is just so gorgeous! Super color! Reminds me of a starry night. So much love for your wonderful card Ana! The background is so beautifully colored and the owl looks magical! The sentiment is very inspirational! Thanks for sharing your amazing creation!